Text: BRING SPRING TO THE BREAKFAST TABLE. Aren't you tired of the monotony of hot, heavy foods? Let's bring a touch of spring to breakfast! 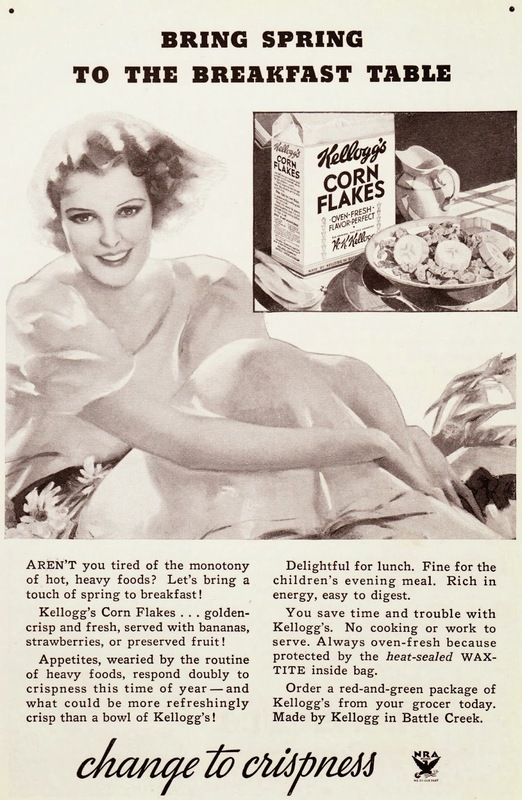 Kellogg's Corn Flakes ... golden-crisp and fresh, served with bananas, strawberries, or preserved fruit! Appetites, wearied by the routine of heavy foods, respond doubly to crispness this time of year — and what could be more refreshingly crisp than a bowl of Kellogg's! Delightful for lunch. Fine for the children's evening meal. Rich in energy, easy to digest. You save time and trouble with Kellogg's. No cooking or work to serve. Always oven-fresh because protected by the heat-sealed WAX-TITE inside bag. Order a red-and-green package of Kellogg's from your grocer today. Made by Kellogg in Battle Creek. Note: No, that's not a Kellogg endorsement of the National Rifle Association (NRA) in the lower-right corner. It's the Blue Eagle logo of another NRA — Franklin D. Roosevelt's National Recovery Administration.